Survival rooms aren't as threatening if you're basically a walking walkthrough. Happy birthday! Have a good day, man! We all wish you a good one Neo! The other two doors are already open? Did they manage to solve it as quickly as Tobi? ...Sorry, I'm a bit out of tune. Hope there's cake. Hope you get a wonderful day and a marvellous year. Thank you so much for blessing us with this amazinging story and gorgeous art. And at your birthday, there will be cake. The author's comment suggests Tobi used her scan ability. She probably did to get more information about the puzzle components, but from what I have seen, I think it would stop there. The rest would be the simple fact she has probably seen every puzzle in that room before in a dungeon. Congradulations, and may your birthdays never make you feel old. Happy birthday! And thanks for the extra updates! Happy birthday. Don't get drunk too much. Or eat too much cake. I recently bought a birthday cake for my bro, and it was soaked in vodka... Helps cope with reality, but hinders creativity. As for Tobi, I suppose she could have used some extra time to dismantle a contraption or two, to fill the pockets with useful stuff. May you have a great day and thank you for your amazing Webcomic. Watch out for and female sounding Robots/A.I.s promising you cake, though. 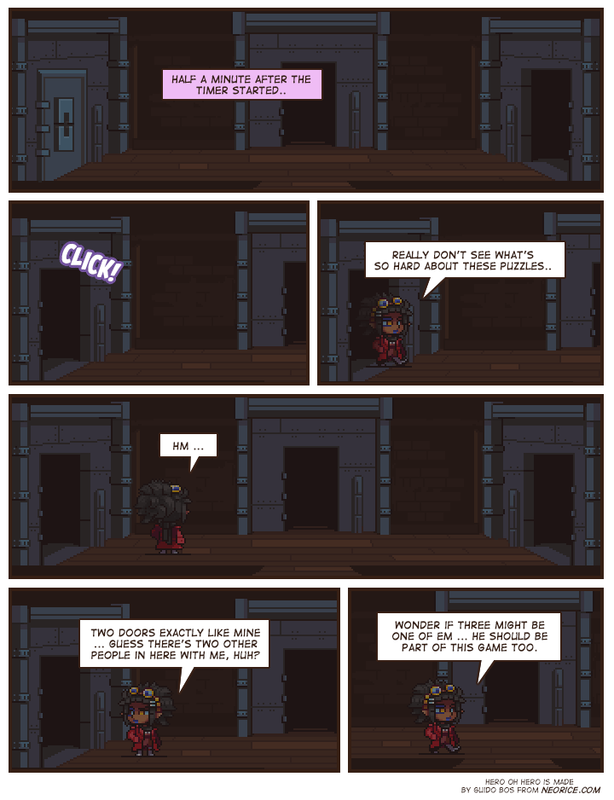 Thanks for this wonderful webcomic you are giving to us, it's always nice to see a new page. Happy Anniversary of the Nth day of the day your mother had surely a lot of stress. GET ALL THE PRESENTS Neo! You've done a great job maintaining this comic. So much dedication! Happy birthday! Many happy returns, as long as they're not boomerangs. congratuations on surviving another year. that's getting more difficult these days, what with all the things being discovered or invented that can hurt people. If 3's strategy is anything like his Deathrun strategy he could just stand by the door till the acid eats thru the door. It might take a few days but he seems patient. Bit late to the party, but happy birthday neo, ma main man. Dude! dunno how much younger\older you are by me, but im the day after you! (March 2nd) Yay for march babies! Dunno about you but I was supposed to be late February but here we are!